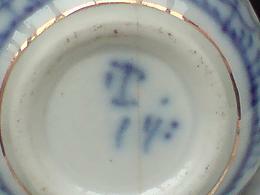 Porcelain Mark Query - What looks like a 'T' on Indian Asian(?) handwritten marking:- Hi Peter, I am a collector, enthusiast, come trader in ceramics and Porcelain, some time ago I purchased a pair of cups and saucers, which, came in a job lot and were secreted at the bottom of the box, under a large platter. - I tend to specialise in oriental porcelain, recently I have re-examined the cups much closer. They definitely have some age, the pattern looks to be prunus. But, the mark still evades me. The style looks more Indian Asian than Oriental. I was wondering if you had any thoughts. I have seen this mark on a few occasions over the years, but the answer has always eluded me. If you can help that would be great. First to say many thanks for running around the site kindly answering questions on the Oriental style marks. Secondly, having done this very kind act, you probably get the gist I am not the worlds' greatest at Oriental or Asian marks, so your knowledge far exceeds mine. However, having said that, I will keep an eye out. What I can do though, is leave this post up here as a kind of a 'marker'. We get found by more and more people 'Googling' away - and I have optimised this page to be found by any interested party. I am pretty optimistic we will eventually happen across someone who will know the answer to this. Anyway, glad we were able to cross paths with this query. By the way, do you have a site you need linking to or anything like that? Researching the identity and value of antique and vintage fine china. The mark on Scott Chandler's pieces is an earlier Tettau mark followed by a number (either for 1914 or as a code for the hand-painter). The pattern, commonly called "Strawflower" on the Continent is based on the ancient Chinese "Wheel of the Year" design. Variations have been made by hundreds of manufacturers in dozens of countries over centuries, probably most famously by Meissen and of course Royal Copenhagen with their "Fluted Blue" version. Many thanks for this marvellous contribution - I really appreciate you taking the time to share this. And thank you so much for your wonderful site. Return to 2. China Chat - German & Bohemia Marks..
Want to know the real ninja of sculpting?